We have at the moment at least 1 confirmed e-mail from Hasbro (UK Division) that states they will not be changing the name. This appeared about 45 minutes on the Bronies Facebook group from a member. So things are looking good for our favorite grey pegasus. To recap, last Thursday we received confirmed reports from a WLF worker that Hasbro was pressuring them to remove the Derpy merchandise, believed to be due to a small group of people who were highly upset about her scene in The Last Roundup. The community rallied behind Derpy with a petition and twitter campaign. Last time we checked the “Save Derpy Petition” had 25,266 signatures on it. Even here at DHN the article on the subject has 22,000 pageviews. Thanks to Beach Brony Bingo for sending this in to us. [03/02/2012] : Comment Section is now closed. There is a central page for DerpyGate located here. This is excellent news! :o) Maybe Life will get back to normal for us fans of the Mail Mare. HELL YEAH. Im so excited! LET’S GET A MUFFIN! What’s this I hear about merchandise? Where can I get any here in Canadaland? This is good. Im hoping that more letter turn up so its 100% true. Who believed that? The WLF employee or just you? What exactly did the source say Hasbro said when they “pressured” (as opposed to, say “demanded”) the removal of Derpy merch? Did Hasbro even give the slightest reason? It’s starting to sound like this whole mess was spirited up from nothing. At least it’s probably over. Glad you’re safe and sound, Derpy. Hasbro isn’t one to address its fanbase, be it ponies, Transformers, D&D, M:TG, etc. This e-mail is really the first thing that has said anything about the whole Derpy situation from Hasbro itself, and even then it ain’t much. What was said by WLF is that “Hasbro is pressuring us to rename and or remove the Derpy merchandise, Derpy needs to be saved”. Its assumed that this was caused by the people who have highly protested Derpy, not the ones with just a disliking opinion, but the people who were writing Hasbro and the Hub, while running petitions against Derpy and her scene in The Last Roundup. The group isn’t all that big compared to the 25k who threw their support in with Derpy. But again, unless Hasbro says anything, we’re still in the dark, but from what I’ve seen, I’d say Derpy is no longer in trouble, and time to move on from this whole thing. I saw a shot of said e-mail on Facebook earlier this morning. Quite the nice surprise. I wonder how much weight the UK division of Hasbro holds over all. I hope this holds weight through the entire company. At the very least, it offers up SOME amount of optimism, even if it would be cautious optimism. If anything, hearing anything at all from ANYONE in the parent company is a good sign. Is LAST ROUNDUP back up on iTunes? Great. Up next: when is Hub going to start airing reruns of the episode? It’s already been pulled twice from the broadcast schedule. Giving a community a present just to take it away is a cruel thing to do. The fact Hasbro has been silent all this time is what really concerns me, Just some random Email from the UK division just isnt going to convince me just yet. Then again, the more I keep thinking about this the less sense it makes, Why would they even remove Derpy? Obviously the party that is offended by her isnt nearly a big as the group that loves her. If they played their cards right, They could make tons of money from just Derpy merchandising. I hope derpy gets saved I mean the shows about love and tolerance and these complainers just couldn’t follow with that motto. we bronies love are derpy and want her to stay the way she is not the way the complainers want her to be. 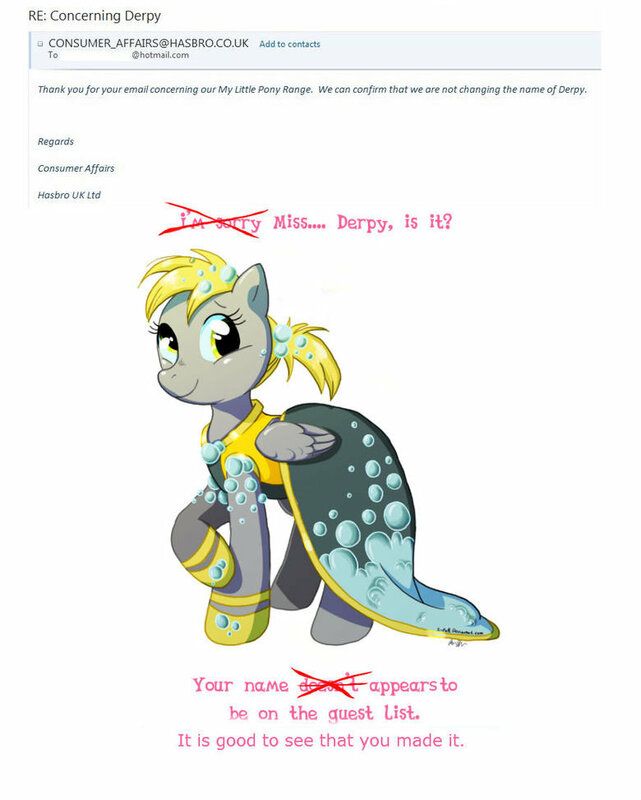 so please hasbro don’t listen to them and keep derpy the way she was on the last roundup when she first appeared as for the merchendising keep derpy’s name on it please. You do know this article is like a month old? She isn’t safe.